A teenaged boy's family is murdered before his eyes, and he ends up in the hospital in unstable condition with multiple stab wounds. In a state of shock, he remains unconscious. Taking the case for the Swedish National Crime Police, Detective Joona Linna decides on an unorthodox approach to questioning his only witness. Dr. Erik Maria Bark is a doctor who has fallen into disrepute for past incidents in which he used hypnotism as a therapeutic tool with mentally disturbed patients. When Joona Linna asks him to hypnotize the boy in order to get to the bottom of the gruesome murders, Erik is reluctant. When he gives in, however, he unlocks secrets that are almost too horrible to believe. 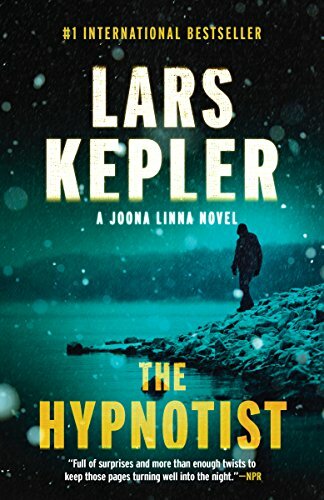 The Hypnotist is the first novel in the Joona Linna series by Swedish husband-and-wife authors Alexandra Coelho Ahndoril and Alexander Ahndoril, writing under the pseudonym Lars Kepler. There are six novels in the series to date. The most recent, Kaninjägaren (The Rabbit Hunter), was 2016’s bestselling novel in Sweden and Norway. Originally published as Hypnotisören in 2009, The Hypnotist appeared in English translation in 2011 to wide acclaim and the inevitable comparisons to Stieg Larsson. Its graphic violence, depressed characters, and bleak atmosphere place it firmly in the Nordic noir sub-genre. Like Larsson's novels, however, it's far too long. Frustratingly, although the family murder and hypnotism of the boy make for a great beginning, the novel soon veers into the mystery of Erik's son's disappearance and his marital troubles with his wife, Simone. This much weaker storyline dominates the novel and morphs it from a crime novel into a psychological thriller with a heavy dose of domestic unhappiness. Which is fine, unless you signed up for the former and not so much for the latter. Consequently, although we’re assured right there on the front cover that this is a Joona Linna novel, it’s actually a novel about a hypnotist, his unhappy wife, and the search for their missing son. Joona’s importance is further eroded by the presence of Simone's father Kennet, a retired police detective who dashes around rather recklessly with his daughter chasing leads one would have preferred the actual detective—remember Joona?—to investigate. Structurally, the novel also has several problems, not the least of which was the authors' decision to drop a hundred-page sequence into the narrative at around the three-quarter mark, switching to Erik’s first-person point of view in order to shovel in his therapy backstory from ten years ago. It’s jarring, far too long, and off-putting. These brief images, unconnected to the story in any way, are nuggets of solid writing that hold such promise of things to come. Indeed, the best thing about The Hypnotist is that Joona Linna’s only getting started. Vintage Crime/Black Lizard has promised to deliver the next in the series, The Nightmare, this fall. While The Hypnotist disappoints on several levels, the Lars Kepler duo have much better things in store for us as Joona Linna develops as a top-drawer protagonist.